1) A 24-hour promoted trend costs about $200,000 on Twitter. 2) Promoted tweets boost offline sales by 29 percent. 3) Twitter is the 2nd most widely used social network (85 percent) by B2B marketers followed by LinkedIn. 4) B2B marketers with Twitter accounts generate twice as many leads than those marketers who don’t have an account. 5) About 88 percent of the B2B marketers are using Twitter in distributing contents. 6) About 19% of B2B buyers research technologies and services to buy through Twitter. [su_box title=”More stats on Digital Marketing :-” box_color=”#c7c7c7″ title_color=”#000000″] 1) Digital marketing stats that will change the way you perceive marketing . 7) About 63% of brands worldwide have multiple Twitter accounts. 8) About 58 percent of the top brands in the world have over 100,000 Twitter followers. 9) About 92% of international brands tweet more than once daily, 36% of which are link-containing tweets. 10) About 42 percent of the international brands post 10 tweets per day on an average. 11) Retailers and restaurants are the most engaging industries on Twitter while apparel businesses are the least engaging industries. 12) EBay is the most engaging brand on Twitter with 1,651,877 engagements in the just 3 months. 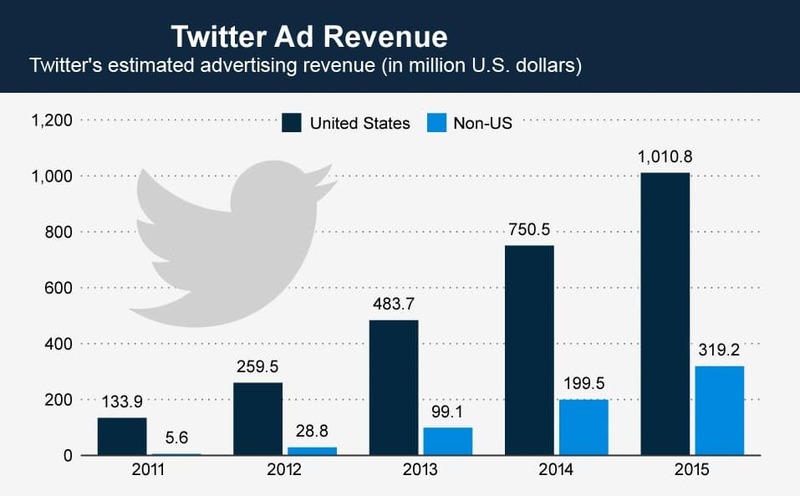 13) Twitter advertising is 6x more expensive compared to Facebook advertising, but the click-through rate (CTR) of Twitter ads is to 8 to 24x higher. 14) About 34% of marketers successfully generated leads through Twitter. 15) Tweets containing image links have 5x higher engagement rate. [su_box title=”More from DSIM :-” box_color=”#c7c7c7″ title_color=”#000000″]1) How Justdial became a Billion Dollar Company? 2) Top 5 budwieser video ads, which one’s your favorite? 16) Twitter would be the 12th largest worldwide if it is a country. 17) The average time spent by a user on Twitter is 170 minutes monthly. 18) There are more than 284 million monthly active users on Twitter, 80 percent of which use mobile devices to tweet. 19) About 63 percent of Twitter users prefer their smartphone as their primary tweeting device. 20) About 71% of tweets are ignored and only 23% generate a reply. 21) Youtube is the most followed brand on Twitter with 51.4 million followers; Instagramis on second with 39.1 million followers and ironically, twitter on 3rd position with 40 million followers.